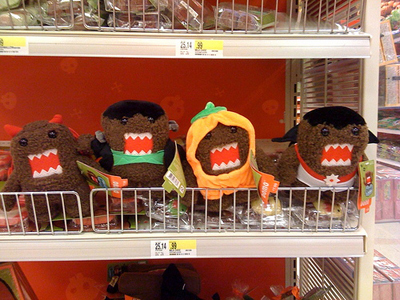 Thanks to all my wonderful blog readers, when I got home from Toronto I had many emails informing me of Domo's presence as the Halloween mascot at Target. Thank you everyone! I scurried over there after work and nearly hyperventalated from all the Domo. Aaron just walked around shaking his head mumbling that he thinks someone at Target is reading my blog. They did a really nice job and the Target I went to didn't even have everything up yet! Well, that just means I will have to go back again in a couple days. I have asked for a post holiday display from the Target people before... and I always got the run around. I don't know if I can handle the rejection again. So cute! I'll have to check it out. I agree, someone must be reading your blog for those great ideas! Uh-oh, now Domo's gonna really get a swelled head! Too bad scientists haven't learned to harness the power of cute, because that display could power a small city. I have to go check out the Halloween stuff! 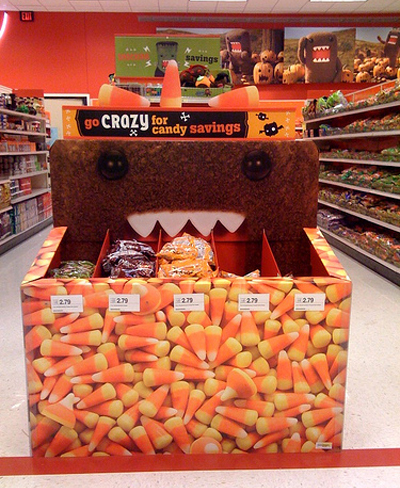 One of my favorite bloggers/designers here in LA also blogs about Domo. She even made Domo cupcakes. That's cool. I remember how excited you were at Easter with the chick and now Domo! You are totally going to have to get a storage unit for all your holiday decor. hmmm...what you should do is find someone who works at target. Then you have an in. and maybe they can fandangle it for you. alas, sorry I do not know anyone who works at target but I am sure someone who reads your blog should. Jenny, there are some Domo shirts on sale at ThinkGeek. Oh! They also have a plush Monster Book of Monster (Harry Potter 3) that actually shakes! I must have one. I figured you must too! I love the paper bats that are all square/Domo-shaped. And have you seen this?? I have a lawn gnome that I take around the world and take pictures with. 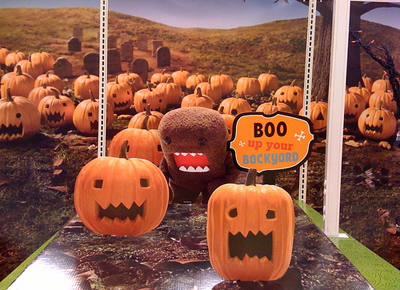 I love your Domo pics! Maybe I should give my gnome a Domo buddy to travel with. I took almost identical pictures of all the Target stuff with my camera phone a few days ago. People thought I was weird. 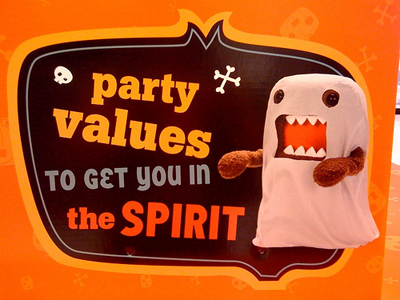 I also tried to steal a Domo sign but it was taped on the shelf. I asked Customer Service about getting a sign after Halloween and they said that if I call in the morning maybe a manager could help me out. where is the location of Target?